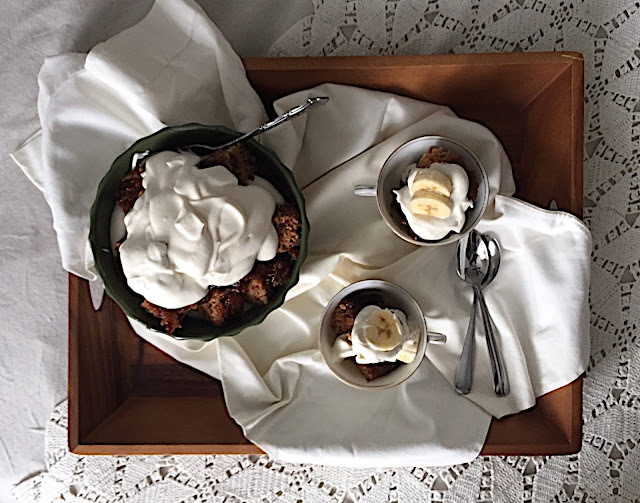 Traditional Amish Date Pudding served at Christmas. It's almost Christmas and my family is on the way from North Carolina to join me in Ohio where we will all spend this holiday weekend together. The only thing that could possibly make me happier is if our daughter, Rosemary, and her husband, Luke, could join us. But, as we are learning, families need to share the love over holidays and the newlyweds can't be both places at the same time. I spent yesterday preparing the traditional Amish date pudding my mom always made at Christmas. It's closely associated with every Christmas memory as a child, and, for some reason or another, I have failed to make it in the years since we moved away from Amish country where this pudding has its place on most every Christmas dinner table, right alongside the pies and cakes. The recipe is from an old cookbook of my mother's, from 1965, a worn and faded book which has been passed on to my daughter. It brought tears to my eyes as I turned the pages and noted my mother's neat handwriting throughout the book as she made notations of adjustments to the recipes she treasured and made often. This Christmas more than any other I am realizing the importance of passing along family traditions. Maybe it's because I'm getting older, or maybe it's because my parents are no longer living and I'm realizing the fragility of life. So for posterity's sake, if for nothing else, I'm making this Christmas pudding and hopefully my daughters will pass along this tradition for future generations. I wish all of you a Merry Christmas as you gather your loved ones close and share food around a table filled with love. Preheat oven to 365 degrees. Butter a 9 x 12 cake pan, or line it with parchment paper. Place dates in a medium sized heat-proof bowl and pour the boiling water over them. Set aside for ten minutes. In the bowl of a stand mixer, add the sugar, flour and soda. Whir a few seconds on low speed to mix, then add the butter and egg and beat for about 30 seconds, then add the dates and water. Mix for about a minute, scraping the bowl. Pour into a 9 x 12 buttered cake pan. Set aside. In a medium bowl, place the brown sugar and butter for the sauce. Pour the boiling water over all and stir with a spoon or whisk until sugar has dissolved and butter has melted. Then carefully pour the brown sugar mixture over the cake batter. Bake for about 40 minutes, or until a knife inserted comes out clean. Cool on a rack. To serve: Cut cake into small squares and layer in a bowl, alternating with layers of whipped cream and bananas (similar to a trifle). Very interesting and delicious recipe! Thank you, Carlos. I'm happy to share this with my readers.